Ok, so our kitchen is being redone. Which is hugely exciting! But also means that my cooking options are rather limited for the next couple weeks. I’ll still try to keep up with posting, but they won’t all be recipes. While we’re trying to clear out the entire kitchen, the last thing I’ve wanted to do is make a big mess by cooking something, so we’ve been eating a lot of crudités and hummus and popcorn. 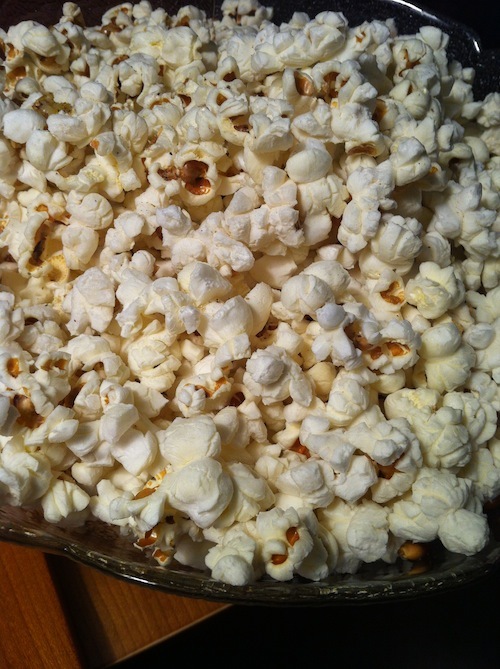 Popcorn is actually a whole grain, so it’s a great snack option and one serving is 3 cups! Sister is totally into popcorn, and her popcorn always tastes the best. So abandon the gross butter-flavored store bought bags of popcorn and spend just a little bit longer making your own on the stovetop. It’s totally worth it. In a large pot (preferably one with a wide bottom, my pot is about 10″ in diameter), heat oil over medium-high heat. To test the oil, add a couple kernels to the bottom of the pan. When they sizzle, add a thin layer of kernels over the entire bottom of the pot. Cover with a lid and wait until it begins to pop. Once it starts popping, carefully give the pot a shake. Crack the lid a little to let some steam out, but be carefully not to get splattered with any oil, or heat by the steam. Continue to shake the pot every so often until the popping begins to slow down. When there begins to be breaks in the popping turn the heat off. Continue to shake the pot until the popping stops. Quickly transfer the popcorn to a large bowl and season with salt (and spices of your choices). Enjoy! Chris loves his popcorn with grated parmesan on top.